Any tea drinker will tell you that each and every tea on the planet coincides with a certain mood or time of day. Each individual drinker must define that time and mood for himself or herself. For me, the sweet yet tart herbal teas such as Bigelow Cranberry Apple are the perfect treat for spring or fall enjoyment. Generally, this category includes the fruity teas that do not have pervasive spices such as cinnamon or ginger, and they must have a little bit of mouth-puckering element to them. For this particular tea drinker (or tisane, if we’re being picky), the choice of drinking tea hot or cold depends largely on the weather. Bigelow Cranberry Apple goes so well either way that I like to stock up on it during the seasons that have both hot and cold weather in the same day. Granted, I live in Wyoming, so that’s quite a bit of the year. Knock the chill off of early mornings without caffeine with a cup of hot Cranberry Apple, or ice it down in the heat of the day before heading out back with a good book. For iced tea, Bigelow suggests brewing Cranberry Apple double strength so that it continues to be delicious as ice melts into it. Personally, I like to brew double strength, chill, and then drink it with no ice – the full flavor is immensely satisfying. Want a little caffeine kick? Do a jar of sun tea with orange pekoe for one-third or one-half of the bags, and Cranberry Apple for the rest. If you liked the idea behind Bigelow’s Pomegranate Pizzazz but wanted just a bit more tartness, this is the way to go. Either hot or cold, the apple in this tea is very easy to detect. In fact, it already tastes a lot like cranberry-apple juice without any sweetener added, so I personally steer clear of honey for this tea. In case you’re not yet familiar with my reviews, I tend to steer clear of sugar for all teas – except, to date, Celestial Seasoning’s Sugar Cookie Sleigh Ride, which actually does scream for a touch of white sugar. 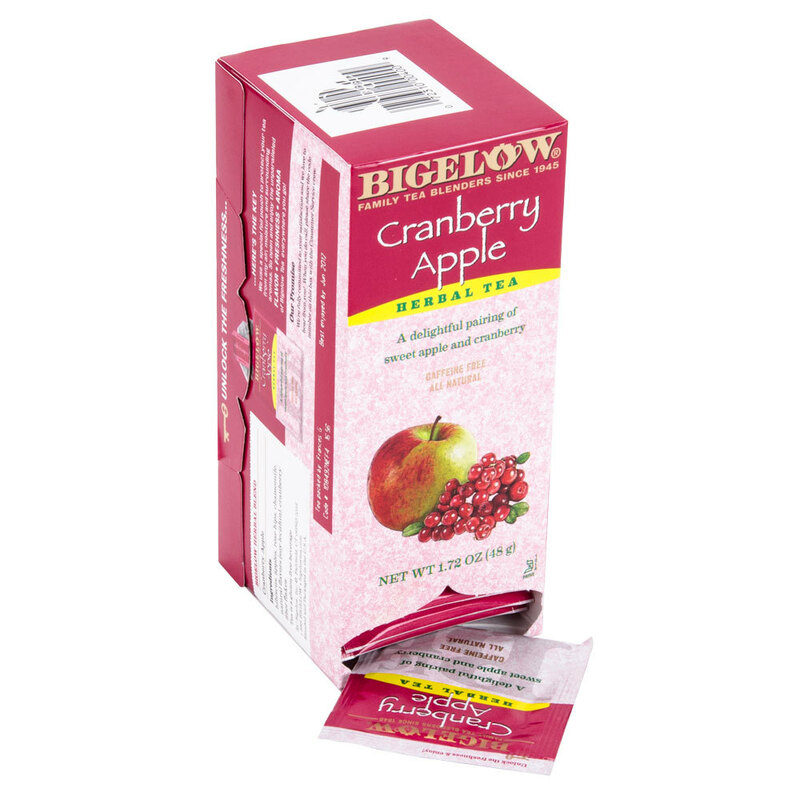 According to the packaging, Bigelow Cranberry Apple include a wonderful blend of hibiscus flowers, cranberries, apples, rose hips, chamomile, and natural flavors. The only real drawback I see here is the last one – call me silly, but anything listed as “natural flavors” on something made entirely of flavorful natural things gives me some pause. It doesn’t stop me from drinking it, but I do pause. It’s pretty short and sweet on the flavors. As I mentioned, it’s very much apple and very much cranberry, expect it to be strong and tart with a touch of sweet. Beyond that, it is caffeine free so it’s a good choice in the evenings or if you abstain from stimulants, and it also mixes well with plain black or green tea. Mixing with plain teas does help mellow the flavor, so that’s something to keep in mind if you bought it and it turned out to be a little overpowering. As with most Bigelow teas, Cranberry Apple comes in a box of 28 individually-wrapped teabags, and they’re fully sealed bags with a string and paper tab. This is probably the most environmentally unfriendly packaging method available for teas, but it is handy if you store all your teas together and don’t want all the odors and flavors co-mingling with the neighbors. It’s also a nice thing if you’re supplying tea to break rooms, public meetings or a large family because no one else will touch your teabag before you. In my local grocery store, this tea retails for $2.89 a box as of 2015. You’ll sometimes find it cheaper at Wal-Mart, but I live in small-town Sheridan, Wyoming with a number of big grocery franchises, so the prices stay pretty steady across the board. Alternatively, or if you can’t find this flavor in grocery stores, you can buy it from Amazon through this link. At the time of this review it is more expensive to buy Bigelow Cranberry Apple on Amazon than at a brick-and-mortar store, but I encourage you to check for yourself since Amazon prices and providers change so often. Overall, this is an excellent tea with more flavor than a lot of the fruity teas from the same brand. It’s good at either temperature, but I’m personally quite partial to it when it’s strong and cold. Have you tried it? Don’t hesitate to leave a comment and your own rating below, I’d love to know the time, mood and preparation style you prefer for Bigelow Cranberry Apple herbal tea/tisane/little bag of yumminess.